Brad Eidsness finished a career at the University of North Dakota and has been receiving offers to play hockey professionally for the East Coast Hockey League and the Central Hockey League. Eidsness then received an offer to attend law school at the University of Victoria in British Columbia. Eidsness was named an All-Western Collegiate Hockey Association twice during his playing career as a goaltender. Eidsness decided to take the offer to attend law school instead of playing hockey professionally. Eidsness hd an excellent academic career, earning his undergraduate degree in three years and his master’s in business administration during his senior year. Two years ago, Eidsness was awarded the NCAA Elite 88 Award, which honors the best grade-point average by a player at the NCAA Frozen Four. Last year, Eidsness won the student-athlete of the year honor from the WCHA. “He’s a guy that took advantage of every opportunity that was in front of him and made the most of every one of them,” UND coach Dave Hakstol said. Eidsness was chosen in the fifth-round of the NHL Draft by the Buffalo Sabres back in 2007. 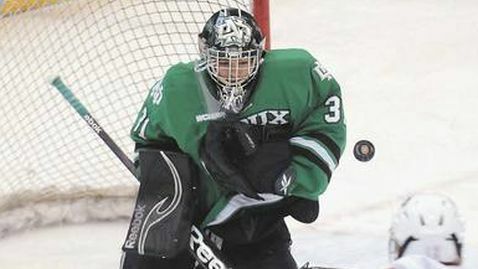 He took over the starting goaltending job early in his college career, leading the team to the MacNaughton Cup, which is awarded to WCHA champions. During his junior season, Eidsness lost his starting position to Aaron Dell but played in seven games. The team won the MacNaughton Cup once again and the Broadmoor Trophy. The team also appeared in the NCAA Frozen Four. During his senior season, Eidsness and Dell battled back and forth for the starting position, with Eidsness recording a .920 save percentage and a 2.16 goals against average. Eidsness was accepted to the University of Calgary but denied their offer. “I was having a pretty good year and I was really enjoying hockey,” he said. “I was planning to play pro hockey at that point.” He then accepted the offer to attend law school at the University of Victoria.